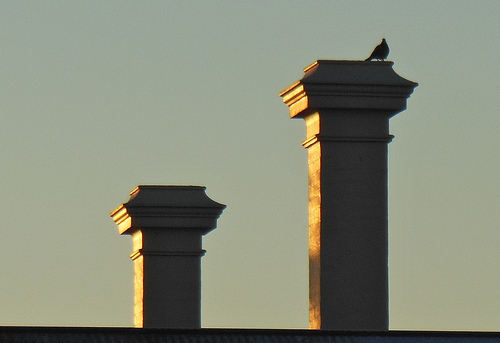 Home Costs > How Much Does It Cost to Reline a Chimney? Relining a chimney is a procedure performed to protect chimney walls from heat and corrosion, and these liners will be installed into the flue of your chimney to restore the sealed vent system. A new liner will be needed because your chimney may not have a liner, the liner is damaged or maybe because the current liner isn’t setup for optimal performance if you were to install a new heating unit such as a stove. The cost to reline a chimney depends on the materials that will be used by the contractor, the size of the chimney, the type of chimney and where you live. On average, it can cost anywhere from $45 to $85 per linear foot to reline a chimney, and since most chimneys are going to be 20 to 25 linear feet, on average, the total costs can be anywhere from $900 to $2,100+for a professional install. Other factors, however, may affect the total cost of the chimney relining. Multi-level homes, for example, will be more than a single story home. The same can be said about the pitch of the roof. Steeper roofs can cost more due to difficulty. Lastly, the number of connections to the flue can affect the price since each gas or vented appliance will need to be re-fitted and sealed. For those who want to do the job themselves, chimney liners can cost anywhere from $80 to $500 depending on the length and brand. For example, the 25-foot stainless steel Simpson DuraFlex retails for $265 to $310. Experts recommend looking into the Flex King or Flex King Pro if you’re considering doing the job on your own. According to one forum member on Hearth.com, he was quoted $1,800 to replace a 4″ by 20 foot liner and was to have it replaced with a heavy wall flex liner. Those on the same thread said this was a fair price to pay. The professional quotes mentioned above should include the cost for all of the materials and labor, including the chimney liner kit, permits if required, all tools and supplies. There are three common types of liners used on the market: clay tile liners, cast-in-place liners and metal flue liners. The clay tile liners can last for close to 50 years and will be the cheapest option out of all types. This liner can withstand deposits of heat and any corrosive byproducts when being burned. Cast-in-place liners is a poured cement process that creates a new flue, which is able to withstand all of the harmful effects of heat, acids and condensation. This type of liner helps the fireplace burn cleaner and can even reduce the accumulation of creosote. A metal flue is highly recommended by fire experts because of its durability. Commonly made of a stainless steel, this liner tends to be rigid, flexible and can be a very good investment if you want a safe and well functioning fireplace. If hiring a professional contractor, the job can take six to eight hours, depending on how many people are working on the job. Name brand liners will often include warranties that can last up to a lifetime. If having a professional install it for you, ask them about the warranty that may be included. Aside from the liner quote, some contractors may charge an additional fee for every connection they need to make, usually around $75 to $150 per connection. This will all depend on the connection size. A liner is an option for any homeowner to consider when they want to have a safer atmosphere. Without a liner, the chimney tile can tend to crack or even mess with the house foundation, and with these cracks, carbon monoxide can get into the home. A chimney liner can also increase the performance of your fireplace. A liner is going to perform adequate ventilation, allowing it to draft hotter gasses. If you plan on hiring a contractor, try to get as many quotes as possible. To make the job easy, consider using HomeAdvisor.com. With this service, you simply describe your project and contractors will offer you a ballpark estimate over the phone and/or via email for free. If a chimney liner has already been installed in the past, a new one may not be required. Instead, a simple cleaning may be needed to ensure that the liner is working the way it should. A sweep should cost no more than $300. Consider using the contractor during their slower season to maybe save a few dollars. With chimney work, September to October tends to be the slowest season.